Making a stacked cupcake cake is a fun, unique way to celebrate a birthday or other special occasion. Though most cupcakes cakes or pull-apart cakes are made for kids, they're equally good for adults, since they're so easy to serve and eat. These cakes are also great vehicles for creativity, since most are frosted and decorated in the same way as a sheet cake despite being composed of individual cupcakes. Most cupcakes cakes are single-level. 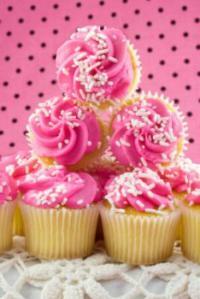 Arrange a group of cupcakes close together on a cake board or stiff sheet of cardboard, frost as a unit, and decorate. Those cakes can also be made into multi-level confections by stacking more cupcakes on top of the first layer, frosting the new layers with buttercream, decorating, and serving. The sides of a multi-level cupcake cake can be frosted or left plain. There are also other types of stacked cupcake cakes. Using different sizes of cupcake pans, it's possible to form a multi-layer cake that uses a cupcake as each layer instead of a larger round cake. To make this cake, use a giant cupcake pan for the base layer. For each additional layer, use a descending size of cupcake. If you can't find a cupcake or muffin pan that corresponds with the size you need, use a cake pan and cut the sides at an angle so the cut cake will resemble a cupcake. Top the stacked cake with a mini cupcake. If you'd like, you can make wrappers for each level of this cake. Another option is to create a stacked cake from normal cake pans and decorate the finished product to look like stacked cupcakes. You can stack the cakes traditionally or in a topsy-turvy style. You can decorate the tops of these cakes with buttercream, but it's easiest to cover and decorate the outlines and bottoms with fondant. You can also coat a number of giant cupcakes with fondant and decorate them to form shapes, such as a castle. Although it's not always as stable as stacking different sizes of cupcakes or layer cakes, you can also choose to stack individual cupcakes to form a small multi-layer cake. Pluck each layer off and eat separately. To make a tiny cake that has less risk of tipping over, stack mini cupcakes on top of regular cupcakes. 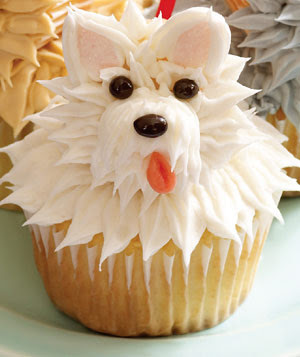 The cover of Hello, Cupcake!, Karen Tack and Alan Richardson's cupcake-decorating book, shows an example of this technique. Another way to stack individual cupcakes in a stable way is with a cupcake stand. You can add more cupcakes on the top layer, place a medium cake there, or decorate a giant cupcake and put it on top. 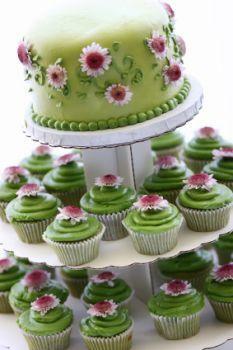 Depending on which type of cupcake cake you choose to make, you can use a variety of decoration ideas. For a multi-level cupcake cake composed of individual cupcakes, decorate as you would a sheet cake. Frost with buttercream and add flowers or other colored accents. You can also use the flat frosted surface as a canvas and pipe a large picture with buttercream. Decorate cupcakes on a cupcake tower or cupcake tree individually, with a star tip and pastry bag, luster dust, or dragées. Make homemade cupcake wrappers for a professional effect after sculpting large cakes to resemble cupcakes. You can tailor each wrapper to the size of the cake you need. Add small candies, sprinkles, cookies, or other crisp decorations to stacked cupcakes to vary the texture of the frosting and cake. The various techniques used to stack cupcakes results in a fun display for your small but delicious creations.